(Nanowerk News) The latest development by engineers of KIT is inspired by nature. 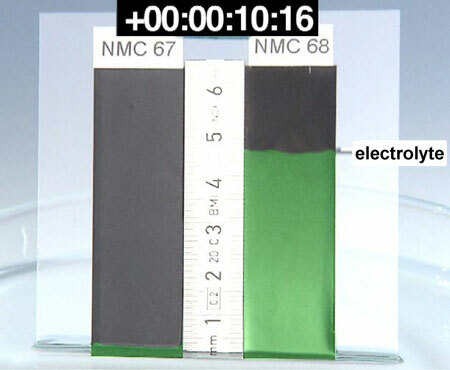 To fill the porous electrodes of lithium-ion batteries more rapidly with liquid electrolyte, they use a physico-chemical effect that also provides for transport in trees. The new process increases the throughput of battery production and reduces investment costs. These and other innovations will be presented by KIT at the eCarTec International Electromobility Fair in Munich (hall A5, stand 323) from October 18 to 20. The electrodes inside modern batteries are as porous as a sponge. Unlike household sponges, however, pore size is in the micrometer range. As a result, the electrode has a very large surface area and provides much space for the chemical processes during electric charge and discharge. This is necessary for developing batteries for electric vehicles that can cover large distances and be recharged rapidly. "But the pores have to be filled completely with the electrolyte in order to work optimally," explains Dr. Wilhelm Pfleging from KIT. The liquid electrolyte is the transport medium, in which the charged ions can flow between anode and cathode in the battery. "Without electrolyte, there is no charge equalization inside and no current flow outside." The materials used in electrodes and the electrolyte of conventional high-energy batteries for automotive industry, however, provide for a bad wetting of the electrode surface by the liquid electrolyte only. Consequently, much time and expenditure in battery production have been spent so far for making the electrolyte move into the smallest pore, if possible, and for maximizing battery capacity. The liquid is forced to enter the material by expensive and time-consuming storage processes at vacuum or elevated temperatures. "Our new process allows to reduce this time from several hours to a few minutes," confirms Pfleging. To achieve this amazing effect, he relies on nature. By a mechanico-chemical technology, the electrodes are modified such that the electrolyte is sucked into the battery as water is sucked into high trees. As a result, the electrolyte spreads very rapidly over the complete material and performance data of batteries based on this principle are much better. "This novel electrode modification drastically reduces the technical expenditure and production times needed for filling lithium-ion cells with electrolyte," acknowledges Andreas Gutsch. Under the Competence E project, he coordinates the activities of more than 250 scientists at KIT to utilize the large innovation potential of a number of partial improvements and to further develop the entire system. "Now, an interdisciplinary team of physicists, chemists, materials researchers, and process engineers has succeeded in making an important step towards low-cost batteries." A patent has already been applied for. The process is planned to be integrated in the production lines of battery manufacturers as quickly as possible. "We are pushing licensing to close the innovation gap between development and industry as rapidly as possible. Several renowned companies have already asked for license contracts. At KIT, we are conducting excellent research for application, not for the drawer."